Figure 4.39. Comparison of SSTO and TSTO results for OEW. (4) SSTO with VDK FUTURE structural concept (advanced 18.0 kg/m2) with 15% dry margin and piloted by automatic flight control system, powered by ejector ram-scramjet of VDK design, HYPERJET Mk #3 [Vandenkerckhove, 1993a]. (5) SSTO with Czysz structural concept from McDonnell HyFAC Study (17.0 kg/ m2) with 15% dry margin and piloted by automatic flight control system powered by engines with maximum airbreathing Mach numbers from 6.0 to 12.0 from the engine sequence in Figure 3.3. (6) TSTO with VDK CURRENT structural concept (reference 21.0 kg/m2) with 15% dry margin and piloted by automatic flight control system powered by ejector ram-scramjet of VDK design, HYPERJET Mk #3 [Vandenkerckhove, 1993a]. (7) TSTO with VDK FUTURE structural concept (advanced 18.0 kg/m2) with 15% dry margin and crewed (piloted) by two crew members with provisions for orbital stay, powered by ejector ram-scramjet of VDK design, HYPERJET Mk #3 [Vandenkerckhove, 1993a]. (8) SSTO with VDK CURRENT structural concept (reference 21.0 kg/m2) with 15% dry margin and piloted by automatic flight control system, powered by ejector ram-scramjet of VDK design with ACES (air collection, enrichment and collection). (9) SSTO with VDK FUTURE structural concept (advanced 18.0 kg/m2) with 15% dry margin and piloted by automatic flight control system, powered by ejector ram-scramjet of VDK design with ACES (air collection, enrichment and collection). Because this is a specific engine design, the results have much sharper minimums than generic engine concepts. In Figure 4.37 we can see the impact of piloted (crewed) systems for both "reference" SSTO and "advanced" SSTO launchers. For the reference the gross weight increment is almost 90 tons. The minimum gross weight occurs at Mach 15 maximum airbreathing speed for the "reference" structural concept, and Mach 14 for the "advanced" structural concept. The gross weight is driven by the difference in empty weight shown in Figure 4.38. In this figure the 90 tons difference in OEW is clearly seen for the "reference" structural concept. 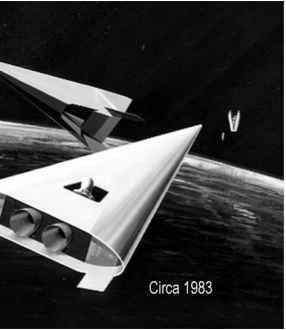 The results from ''hypersonic convergence'' [Czysz, 1989] is close to the results for VDK "advanced" solutions. The difference is the family of combined cycle propulsion yields a design point at each Mach number whereas the VDK results are for a particular ejector ramjet engine configuration. Examining the TSTO results there are two interesting observations. The first is that the minimum empty weight of both TSTO stages is about the same as the single SSTO stage for both the "reference" and ''advanced'' structural concepts. This means that other than design and engineering costs, the airframe cost based on weight should be quite comparable. Note that the design, engineering and production costs are not the driving costs in launcher operations (see Figure 3.2). The second is that the gross weight for the ''reference'' TSTO is only slightly greater than the "advanced" SSTO, and that the ''advanced'' TSTO is one of the lowest gross weights. This is due to the fact that much less mass (second stage only) must be delivered to orbit for the TSTO compared to the entire SSTO vehicle. So TSTO can have an acquisition and cost advantage over SSTO. If both vehicles are automatic then crew costs are not a factor. The last comparison is the addition of ACES (air collection, enrichment and collection) to the SSTO propulsion system. This permits the SSTO to have an offset capability analogous to the TSTO as it collects the enriched air oxidizer for ascent into orbit. Jean Vandenkerckhove and Patrick Hendrick wrote the complete ACES performance code themselves rather than depend on 1960s programs. The performance of the hardware came primarily from two sources, John Leingang in the United States and M. Maita and his colleagues with the National Aerospace Laboratories (now: JAXA) in Japan. 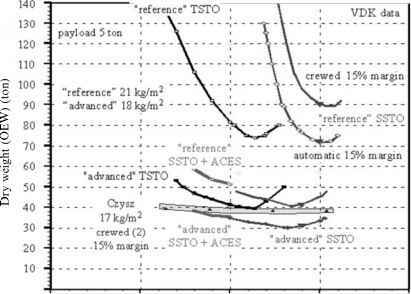 The results show that the addition of ACES to SSTO results in the SSTO weight now being equivalent to TSTO. The results are different that those from Figures 4.31 and 4.32, but the Vandenkerckhove results are based on a detailed system analysis of individual hardware items, while the other results are based on correlated results. However, the results are not that dissimilar in that both suggest that an SSTO with ACES is as light as an advanced SSTO. Examining Figures 4.31 and 4.32 there are a number of options that yield very similar results. Considering the "advanced" SSTO with automatic flight controls for a maximum airbreathing Mach number of 14, and the "reference" TSTO with automatic flight controls for a maximum airbreathing Mach number of 12, and the "reference" SSTO plus ACES with automatic flight controls for a maximum airbreathing Mach number of 10, we have three different systems, two of which use current materials and fabrication capability, with essentially the same gross weight and different empty weights. Considering the "advanced" TSTO with automatic flight controls for a maximum airbreathing Mach number of 12, and the "advanced" SSTO plus ACES with automatic flight controls for a maximum air-breathing Mach number of 10 we have two different systems with essentially the same gross weight and similar empty weights. So there are two approaches to reach minimum weight launchers. One way is to focus on TSTO with inherent payload size and weight flexibility or focus on SSTO with ACES and a more focused payload capability, such as discussed for the Model 176 resupply and crew rescue vehicle for the MOL.